Boxing fans in Ebonyi have hailed Nigerian-born Briton, Anthony Joshua, for boosting the country's global image by retaining his heavy-weight title belts on Saturday night. They gave the commendation in separate interviews with the News Agency of Nigeria (NAN) in Abakaliki on Sunday. 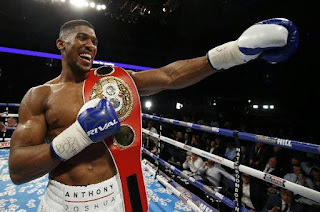 NAN reports that Joshua successfully retained his World Boxing Association (WBA) and International Boxing Federation (IBF) titles over Cameroonian-born, Frenchman Carlos Takam on Saturday night. Joshua achieved the feat via a 10th-round Technical Knockout (TKO) over his opponent at the Municipality Stadium in Cardiff, Wales. The fans, who blamed referee Phil Edwards for controversially stopping the bout in the 10thround noted that Joshua had brought global attention to his country of birth, Nigeria just as his naturalised country, England. Jossy Nkwuda, former boxing coach with the Ebonyi Sports Council, noted that Joshua had successfully stepped into the shoes of boxing greats such as Muhammed Ali, Joe Fraizer, the Klitshckho brothers, among others. "It is rare to see a boxer retaining two heavyweight boxing belts in modern times as we pray that Johsua sustains the momentum longer than Ali and the Klitsckho brothers. "This feat shows that Nigeria is blessed with abundant talents who can project its image with adequate human and material management, dedication among others," he said. Jude Kanu, an amateur boxer in Ebonyi, who is commended Joshua for the feat, however, advised him to work harder in maintaining the present boxing glory he is revelling-in. "Joshua, with the feat, earned the 20th TKO of his career thereby surpassing Mike Tyson's record of 19th TKO and one behind legendary Frank Bruno on 21st," he said. "Nigerians should use the feat as a rallying point to achieve unity which would guaranty economic, social development and global recognition,"
Paschal Mebuge, a transporter and boxing buff noted that Joshua's performance fell below standard, compared to his historic win over Vladimir Klitchko earlier in the year. "He could still have won the match despite the crowd's disapproval of the bout's stoppage by the referee as he clearly outclassed Takam.